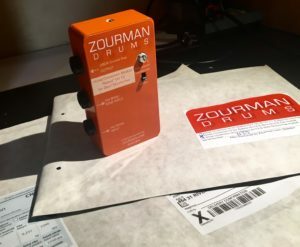 The Zourman hi-hat conversion module (formally 42Box) replaces a standard 2box hi-hat (hall effect sensor-based) with your favourite Roland hi-hat. The solution is 100% plug and play (only 2box hi-hat calibration needed) and handles both a Roland hi-hat pad (bow/edge) and the hi-hat control pedal through the two input connectors. The conversion kit electronics and intelligence combine the three trigger signals and deliver the output into a standard 2Box hi-hat input (single stereo jack). These models supports Roland FD-7, FD-8, FD-9, VH-10, VH-11, VH-12*, VH-13* and now also ATV aD-H14*! The FD-8/VH-11 model do also work for Roland compatible hi-hats like JOBEKY 13, 14″ REAL FEEL CYMBAL AND HI-HAT CONTROLLER and Go Edrum GH6 eHi-Hat. Tests have also shown that FD-6 works with the Zourman Drums Hi-hat Conversion Module för FD-8/VH-11. Virtual Clutch models There also new models added of the Zourman hi-hat conversion modules which includes the Virtual Clutch functionality**. Virtual Clutch is a system where the hi-hat pedal position can be set & fixed in advance between open/closed. A perfect solution for drummers with double kicks who wants alternative their play style. A switch on the front will set the Zourman hi-hat module in virtual clutch mode. * Sold as a separate models – see online store.